↑ "FAQs". CONSOL Energy Center. สืบค้นเมื่อ April 14, 2012. ↑ "Consol Energy Center". Populous. Archived from the original on February 27, 2012. สืบค้นเมื่อ February 1, 2013. ↑ Belko, Mark (October 14, 2009). "Architect Predicts Aug. 1 Completion of Pittsburgh's New Arena". Pittsburgh Post-Gazette. สืบค้นเมื่อ October 14, 2009. 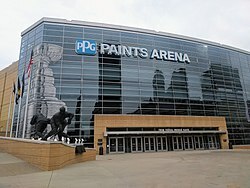 ↑ "Consol Energy Center Is First NHL Arena To Achieve LEED Gold Certification". National Hockey League. August 4, 2010. สืบค้นเมื่อ August 4, 2010. หน้านี้แก้ไขล่าสุดเมื่อวันที่ 19 พฤศจิกายน 2560 เวลา 11:43 น.